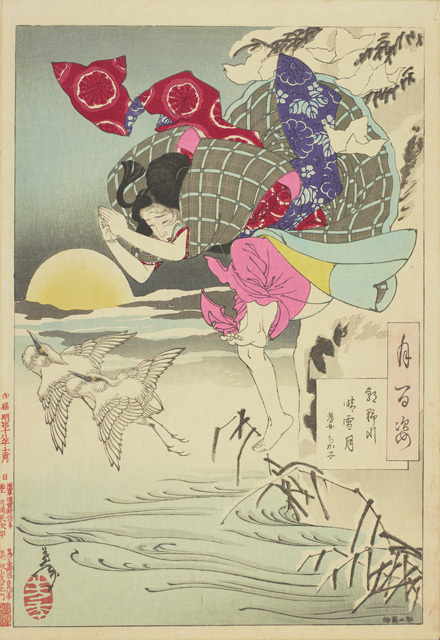 Following our previous exhibition “Specters by Tsukioka Yoshitoshi” (July 29 ~ August 27, 2017), we would like to further explore in depth the fascinating world of Tsukioka Yoshitoshi, an ukiyo-e artist who lived from the end of the Edo period to the Meiji period. In this exhibition, we will present “One Hundred Views of the Moon” series, which are Yoshioshi’s masterpieces from his last year. 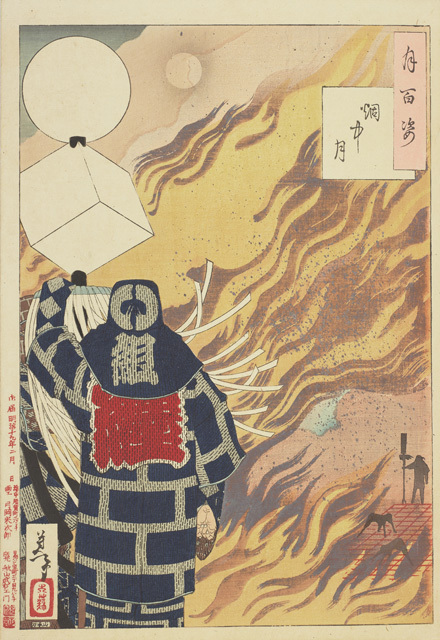 As the title describes, “One Hundred Views of the Moon” consists of a total of 100 pictures. This exhibition provides a very rare opportunity to see all the pictures in one place. 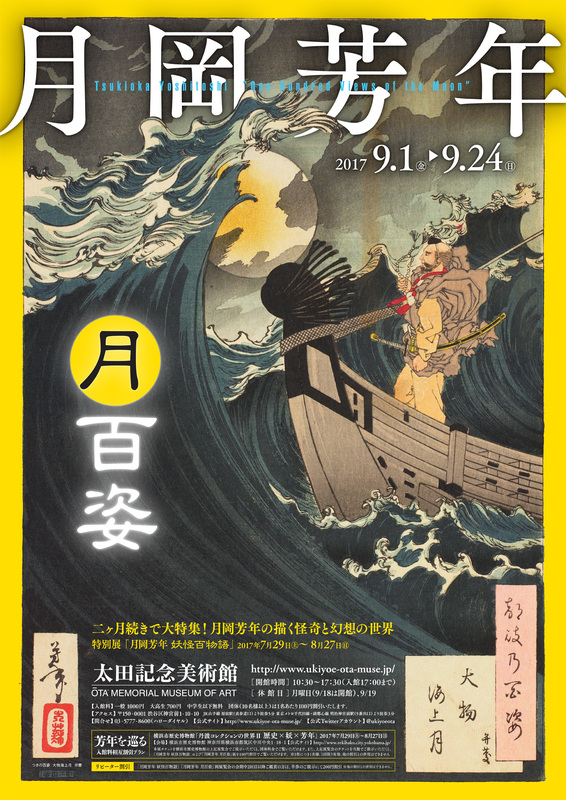 It is also an unmissable opportunity to see the ultimate achievement of Yoshitoshi, who is renowned as the last ukiyo-e master. 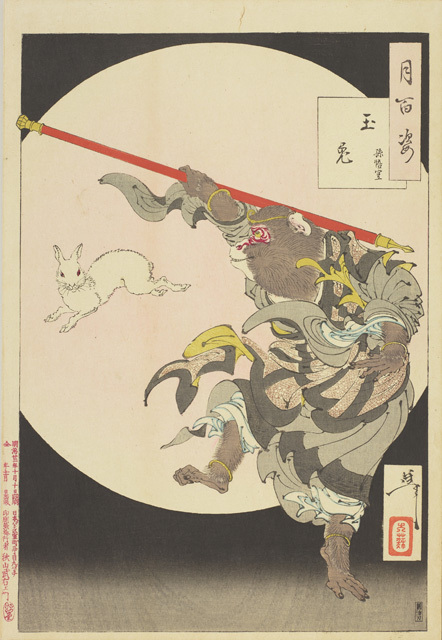 The themes of “One Hundred Views of the Moon” are based on stories related to the moon. They vary widely, from warriors and beautiful women in the Heian period and the Age of Civil Wars, to mystic creatures such as ghosts and monsters. 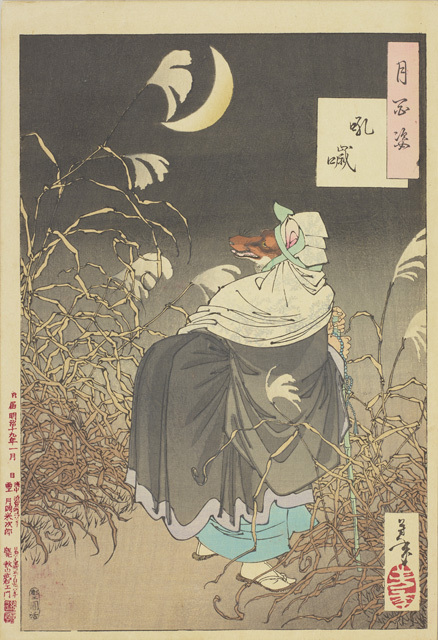 In this exhibition, we will aim to present a clearer view of the world of “One Hundred Views of the Moon” by categorizing them based on four different aspects: 1) beautiful women; 2) specters, ghosts, deities and Buddha; 3) brave men; and 4) refinement, nostalgia and sorrow. We hope you will enjoy a variety of stories surrounding the moon, which are appropriate for the autumn, the season of beautiful moon. 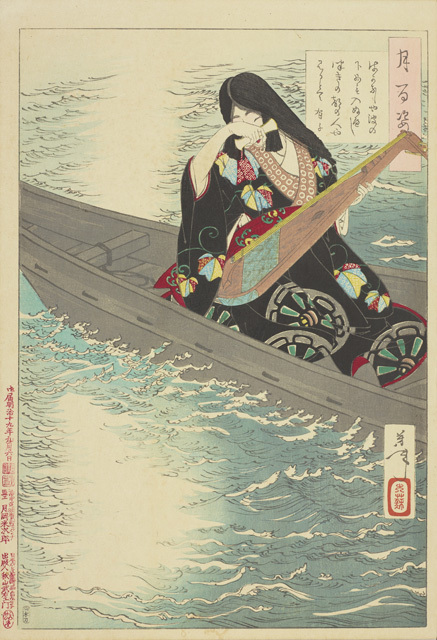 the sophisticated carving skills and the beauty of prints presented in these works make the viewers say “Cool!” or “Beautiful!” even in modern days. 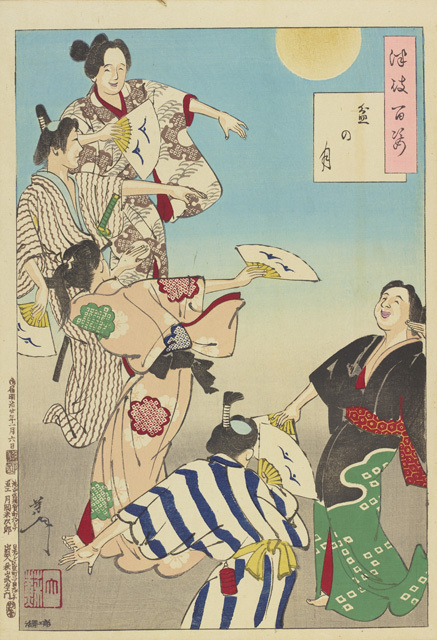 The “newness” of “One Hundred Views of the Moon” is highlighted in this exhibition. 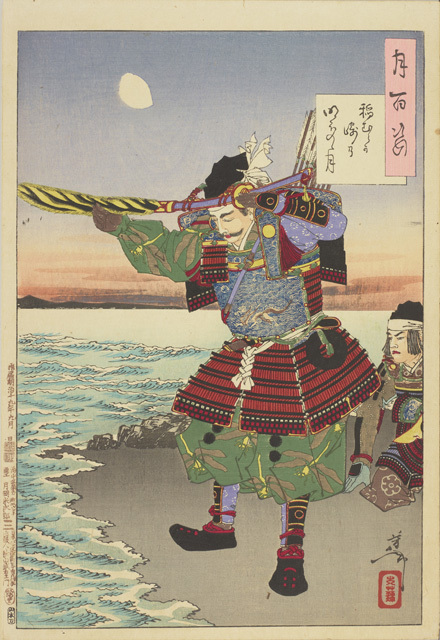 When Minamoto no Yoshitsune and his retainers embarked from Daimotsu Bay, suddenly a storm came and vengeful ghosts of Heike warriors, who were defeated and sank into Dan-no-ura Bay, tried to prevent Yoshitsune’s voyage. One of his retainers Benkei, however, impressively warded off the ghosts by chanting Buddhist prayers. 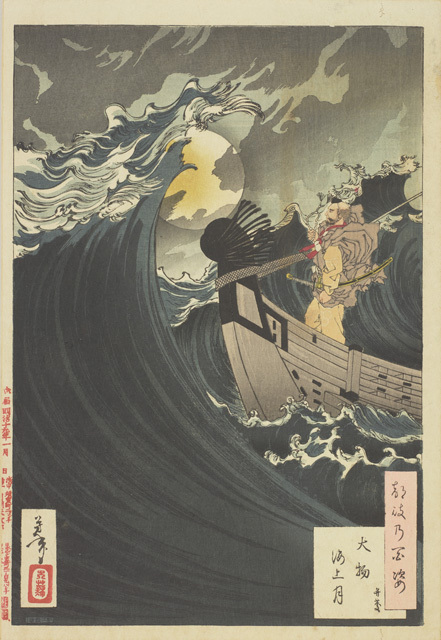 Although the vengeful ghosts of Heike warriors are not clearly depicted in this work, the pitch-dark ocean that occupies a large part of the picture and the ominous movements of the waves that are crashing over Benkei give uneasy feelings to the viewers. 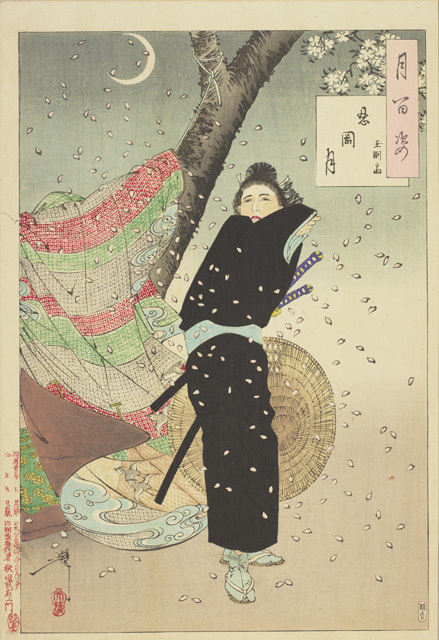 This meticulously calculated, powerful picture represents typical characteristics of Yoshitoshi’s works.